Digital Textile Print - Fabric Pre-Treat Or In-Line? What’s the difference? Chemical Pre-Treatments are required for all Digital Printing systems that print ‘wet on dry’ i:e Ink onto dry fabric. In the case of Reactive, Acid, Disperse and Dye sublimation (DTF) pre-coating of the printed base fabric is necessary because Digital printhead technology cannot handle the additional viscosity of a colour formula within the ink. The formulation prevents ‘wicking’ which is defined as the random spread or migration of colour after printing. Pre-coating is essential to enable a sharp print mark or register on the surface of the fabric. Pre-treatment coats the fabric with a binder and cross-linker which enables the ink to bond to printed fabric in order to attain acceptable commercial standards, as far as colour density, wash and rub fastness, and print quality are concerned. This requirement for pre-treatment, has created a rapidly expanding micro market for PFDP (prepared for digital print) Fabric. It should also be noted that pre-treated fabrics have a shelf life, and dependent on the chemicals used degrade within three to six months post coating. Traditionally, the equipment (used in the coating of other textiles) is quite cumbersome and space consuming, and inefficient in its use of energy. However, as the requirement for PFDP fabrics grows, a new generation of mini-coating technologies are available. Each of these methods have specific characteristics, the Foulard, for example delivers a double-sided printability to the fabric, while the Spray and Screen methods only apply the treatment to one surface of the fabric. Rates of deposit vary too, with the most intense being available on the Foulard, and the lightest concentration on the Spray and Vacuum Slot. Finally, the addition of a pre-coat, regardless of technique, adds solids to the fabrics composition and can cause the fabric to lose its natural handle and drape, which can be rectified by a further post-process after printing or the addition of softening agents to relax the fabric. Whatever the Technique, the price of the process and of the chemicals used add additional cost to the widely available general textile substrates. There have been substantial Innovative technical developments. 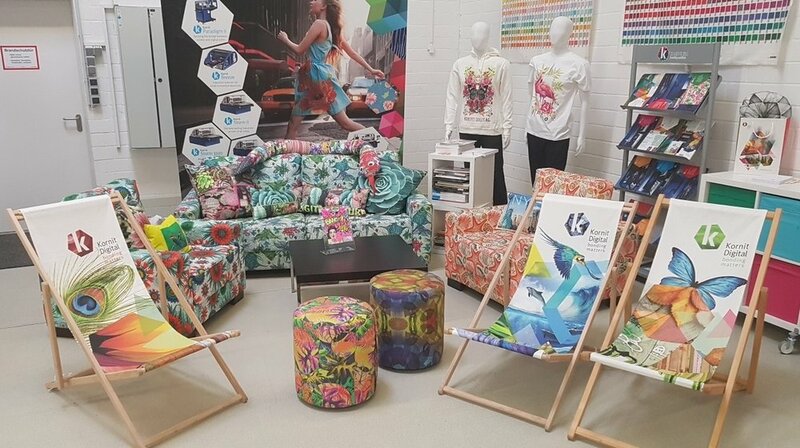 The Kornit Allegro Digital Textile Printing solution (DTF) by example, prints ‘wet on wet’ (i:e ink onto wet fabric) printing onto any fabric, in one pass, without the need to purchase pre-coated fabrics. Simplifying the production process to offer a sustainable energy efficient option. The results are superior commercial fabric fastnesses, a vivid colour gamut and excellent print-mark and register. Coupled with the capacity to print any fabric this machine offers an efficient solution and points the way to the future for small or large volume production…Whereby Digital Textile Printers will be able to use a wide selection of Fabrics, sourced on the world market at commodity prices, reducing inventory, and moving closer to the final selling price thats associated with analogue print alternatives.